I am a professional artist who is very bad at getting round to sketching- simple, brief observation of life… and cats. Which is a shame, because that sort of thing is very good practice for the eye and the brain. Recently I moved out of the dark ages with respect to my phone and I finally have one that can do everything, including make little sketches with (it’s a Samsung Galaxy Note 3 if you are interested). And the most curious thing happened: I began actually sketching with it on a daily basis. This has never happened with a real sketchbook made of paper for many days in a row, ever. So, in an attempt to keep this up, I began posting the sketches first to facebook to share with friends and then, not wanting to overload my ‘proper’ blog with sketches I hope to keep a daily sketchbook online here. Digital sketches are not real and tactile, I will admit, but what may not seem worth carrying round a sketchbook for can be a worthy subject for an enlightening and entertaining little digital scribble. And, more to the point, these subjects stand a chance of actually getting sketched, if I have the means handy to do it. And they all feed in, in the end, to my ‘proper’ artwork, which is not very proper at all and largely drawn from my memory and imagination. 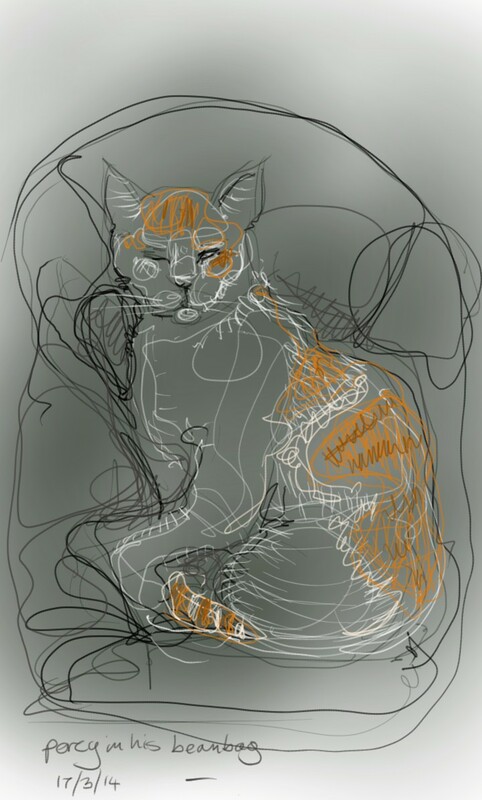 ‘Cat-of-the-Day’ was the title I gave the first digital of my sketches of cats that I posted online. My artwork is figurative – I like anatomy and body language and gesture, but I am often on my own in my studio, and the only other living beings to wander in and out for most of the day are cats. There will be a lot of cats in this blog; it is not all cats, but I liked the title so I have stuck with it. I hope you enjoy some of the sketches, and if you are curious as to what I usually do, have a look at www.nancyfarmer.net as well. Do you sell your work? I’m VERY interested. Hi, thanks for enquiring! I am very new to digital drawing, but a couple of people have asked if I intend to sell prints of these so I do intend to print some up to see how they come out. They do look lovely on a watercolour-texture archival paper, which I usually use for prints of my other artwork (www.nancyfarmer.net) – I have just not had the time to experiment with printing them yet, or know how big I can print them. I can get back to you. Was there one in particular that you were interested in?